I was invited to share a free VBS resource with you which equips your church to help children and families in your community who do not have enough to eat, so, of course, I am very happy to do so! Society of St. Andrew (endhunger.org) is a nationwide faith-based nonprofit which engages volunteers in hands-on mission and service, gleaning in fields to recover fresh fruits and vegetables which are shared with agencies feeding the hungry. Last year, their 36,848 volunteers distributed 96.5 million servings of nourishing food right here in the US. Their mission statement talks about nourishing souls as well as bodies, which they do through Lent and Advent devotional materials, a hunger focused Bible Study for youth and adults and a work/study mission retreat program, Harvest of Hope. They also create VBS resources every year, primarily for congregations wanting a mission emphasis to add on to their VBS using commercial curricula. This year, they’ve put together two VBS options. 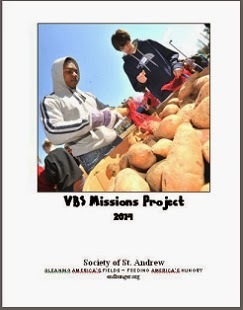 The first is a VBS Mission Project, containing 5 full-color photos of Society of St. Andrew at work; each accompanied by a mission story. There are suggestions for mascots & scenery and 10 related optional mission activities. The VBS Mission Project is envisioned as a 15 minute daily missions/missions offering focus time within a 3 hour VBS program, but could be expanded to 45 minutes (for a rotation/center model) with the optional activities. Their second option is a complete, stand-alone, no frills, all-in-one VBS - “Abundance Orchard: Where faith grows and hungry people are fed” This “Year 1” curriculum focuses on Old Testament stories about food and eating: Abraham and Sarah entertaining angels; Jacob and Esau’s birthright for beans; The Passover; Manna and quail in the desert; and Elijah and the Widow of Zarephath. It’s designed primarily with smaller churches in mind, keeping expense to a minimum, and assuming broadly-graded age groupings. The VBS includes Bible background and teacher reflection/preparation for each day; a related daily memory verse; and complete guides for Storytelling, Music, Recreation, Snacks, Mission, and Arts & Crafts. Leader planning information, backdrops, scenery, and mascot ideas are included, as well as a few reproducibles and some additional helps (a supply purchasing list and extra ideas for preschoolers, for instance). They’ve added a Pinterest page with more ideas and resources to accompany Abundance Orchard. The VBS Mission Project pieces will change every year, but the Abundance Orchard will be available for several years joined next year by a “Year 2” curriculum which will have a New Testament focus. The Abundance Orchard curriculum would also work well for a rotation model Sunday School, a weekday afternoon children’s program, a retreat, summer Sunday School, etc. All of the Society of St. Andrew’s resources are offered free of charge. They ask congregations which use them to commit to receiving offerings to further Society of St. Andrew’s ministry as part of their program. So, let's take a closer look at these resources! First for the Mission Project . . .
Order ONE COPY for your congregation. Now for a closer look at Abundance Orchard VBS . . . Excellent information about keeping child safety a priority! Lessons involve children in presenting the Bible lesson with dramas - Love this! This resource is Free and it is well written to help children and families understand how there are people in their church and community who need help getting enough food to eat. As they learn about people in the Bible and specific meals they ate, they will also learn about how God provides. They will be challenged to live what they learn by serving and helping others in need of food. It would be easy to add an evangelism focus to this resource and I'd likely do so, but other than this, there is little you would need to add to make this resource an excellent option for VBS, or Summer Sundays, Mid-Week or as an excellent resource to use for a mission conference. You will find the information to download this Free VBS at the following link. Definitely check it out and consider how you might use it in your ministry!